There are many monoclonal antibodies for which the hybridoma cell line is unavailable. To complement our hybridoma sequencing service, we are also offering a de novo antibody protein sequencing service. 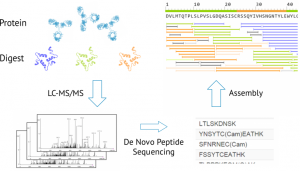 By combining mass-spectrometry with high-accuracy de novo peptide sequencing and assembly of overlapping peptides, the amino acid sequences of the variable domains are determined. De novo sequencing workflow: The antibody is digested using multiple enzymes. On each digest LC-MS-MS is performed and peptides predicted de novo. Using proprietary software, overlapping peptides are assembled into a full coverage protein sequence. can sequence an antibody and deliver recombinant versions in as little as 9 weeks. The whole combined service is priced at 13,600 GBP / 17,500 USD / 15,300 EUR. For more information please contact us.